The days right after Christmas provide for a particular time of reflection. The somber realization that another year is winding to a permanent close is replaced by the anticipation for the celebration of the new year about to begin. It was during this special time in 2012 that I was able to spend a Saturday with master luthier John Greven. I was in my hometown of Portland, Oregon over the holidays and contacted a delightful fellow Guild 12 string aficionado, Duffy Calloway. He is the proud owner of a fabulous 40 plus year old guitar with an even more fabulous story to accompany it. Duffy invited me over to a friend’s house to see the instrument and jam a little. That friend was John Greven. 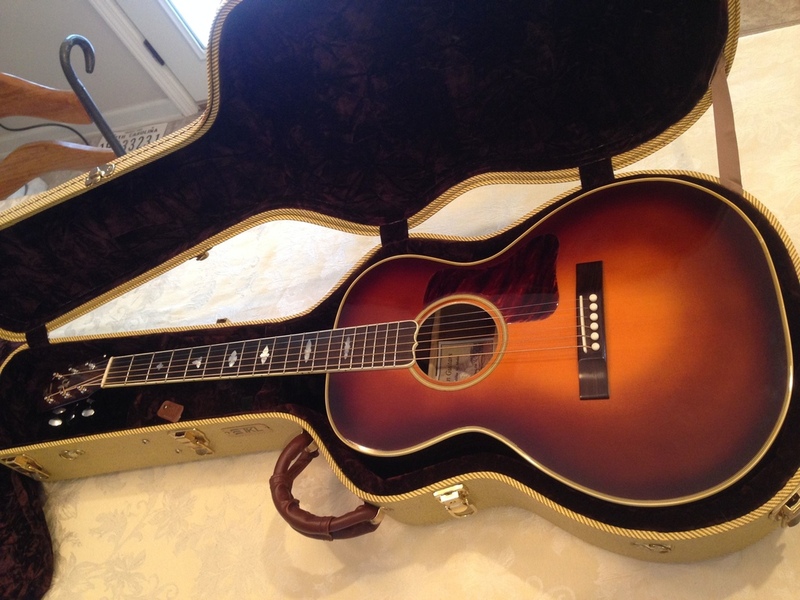 I am the proud owner of a 2005 Greven Nick Lucas with Brazilian Rosewood back and sides, which I am rather fond of. I was thrilled to have the opportunity to spend some time with it's creator. John and Duffy met me on the front porch of John’s immaculate and lovely home, situated on a classic tree-lined street in SE Portland. I had brought along a Taylor K-24ce (all Koa 6 string) that I was traveling with and opened up the case straightaway upon entering. I played a few instrumentals and shared some life adventures. John graciously commented on the surprisingly well-balanced sound of the Taylor, which I handed to him for closer scrutiny. Next up was Duffy’s glorious Guild 12 string. This circa 1960’s F-512 was one of 2 special guitars made, both having Brazilian Rosewood back and sides, the other having been purchased by John Denver. This guitar was such a delight to play. Guild jumbo’s are loud by design, and can be ‘boomy’. This 12 string was loud, but the brilliance of the tone made for anything but a boomy experience. It was a shimmery orchestra on my lap, and it’s sound brought smiles to faces of everyone present that morning. Duffy is a good player, and it was a lot of fun to listen to him make that Guild talk! Prior to my arrival, John had brought several of his own guitars into his dining room, each still housed in it’s respective case. It was at this point that he began to select one instrument at a time and hand to me to play. What an honor, to be sitting in this humble man’s home playing his incredible creations. One astonishing guitar after another, I was nearly an emotional wreck when John handed me the smallest of the instruments I would play that day. 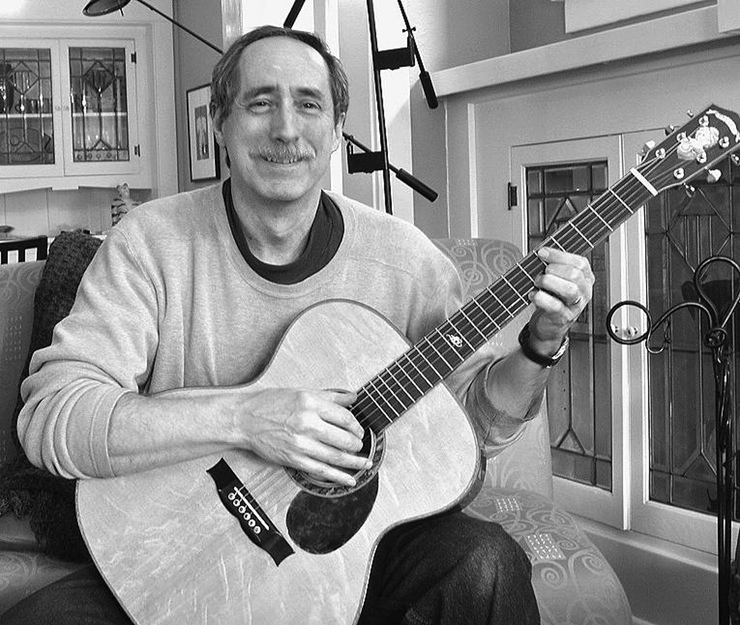 It was his Parlor guitar, a short-scale 12 fret modeled after a Martin 00-28. 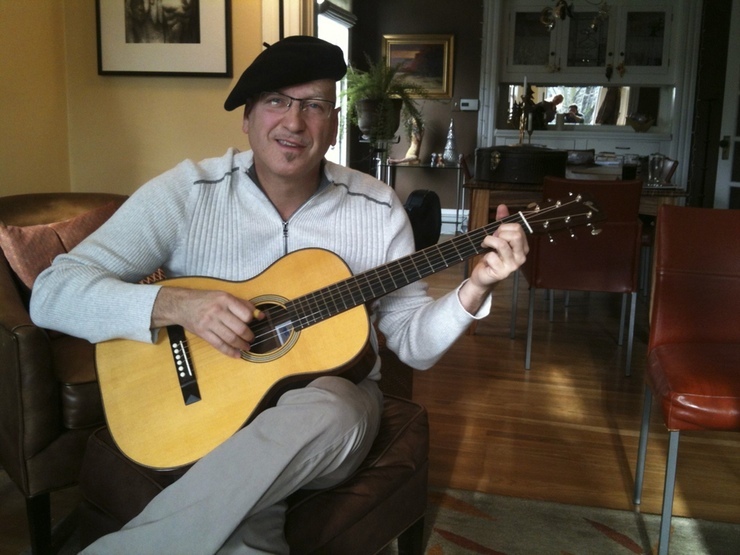 The guitar was small and light enough that I had to reposition it in my lap, classical guitar style, which amused John. As I began to play, the guitar began to quiver in my arms, the sounds reverberated in my chest, and tears began to fill my eyes. What an amazing experience, one that words alone cannot describe! John was not selling this particular instrument (I know because I asked - ;~}), and I understood the reason. What a guitar! I shared with him that he had forever altered my understanding and respect for a small-bodied guitar. It wasn’t the first time he had heard that. After the others had left that day, John invited me to his workshop where the magic happens. As we toured his own private stash of select woods, sifted through his jigs and customized work areas, talked about his finishing techniques and surveyed his spectacular inlays (for which he is also world-renowned), I was the proverbial ‘kid in the candy store’, with eyes wide open and mouth agape. He was more than generous with his valuable time and his wealth of knowledge of lutherie that day. Like a great teacher, he was answering questions I hadn't even thought to ask. It was delightful to spend that Saturday with him, listen to his stories, play his guitars, and see where and how he produces the instruments responsible for such evocative sounds. Times such as these are invaluable to me, as they allow for an infusion of knowledge on a massive scale. I cherish the one-on-one interactive session I had with John Greven. Thank you, sir!